Questions? Reach out to Sales Manager Diane Cyphers at dcyphers@mtlebanon.org. Circulation targeted to the valuable Mt. Lebanon market without the costly spillover inherent in every other advertising vehicle. 100 percent saturation mtl magazine reaches virtually every consumer and business in Mt. Lebanon. Direct association with a quality publication and knowledgeable community, which reinforces the advertiser’s image. CONTRACT REGULATIONS: Advertising must be inserted within one year of first insertion to earn frequency discount rates. Multiple ads within a single issue count toward discounts. An advertiser who does not complete a committed schedule will be subject to a short rate. PUBLISHER/ADVERTISER: All advertisements are accepted and published upon the representation that the party placing the advertisement is authorized to submit and approve such publication. The advertiser agrees to indemnify and save the publisher harmless from and against any loss or expense on claims based on the content or subjects of the advertisement. 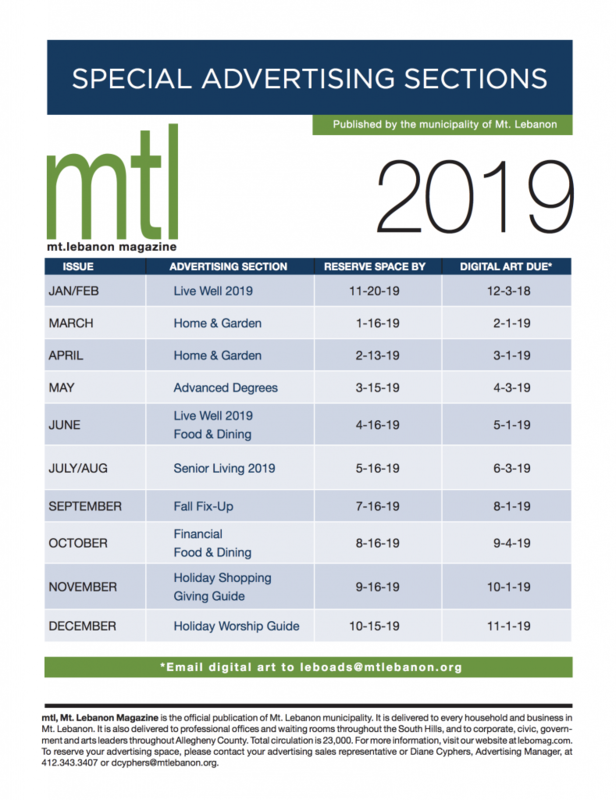 ISSUANCE, CLOSING DATES: mtl magazine is published 10 times per year: January/February, March, April, May, June, July/August, September, October, November and December. The magazine arrives in homes during the first week of every month an issue is published. Closing date for space reservations is six weeks prior to publication. Final date for receipt of digital/ready-for-print materials is the 1st of the month preceding publication. Online deadlines are more flexible. Contact us for details. AD CANCELLATIONS must be received in writing and will not be accepted after an issue has been closed for advertising. AD CREATION: mtl magazine will create an attractive ad for your business or revise an existing ad file for $30. Research/use of stock photography will be charged at $30 per image. More than one scan, color corrections, and photo retouching will incur additional charges. Advertiser is responsible for supplying preprinted inserts for magazine insertion and mailing. Contact us for specific insert quantity needed and deadline date.